Our Club averages 500 hours/year grooming, and our goal is to have the smoothest trails in this area. Thank you for your support in purchasing a permit from us this season! 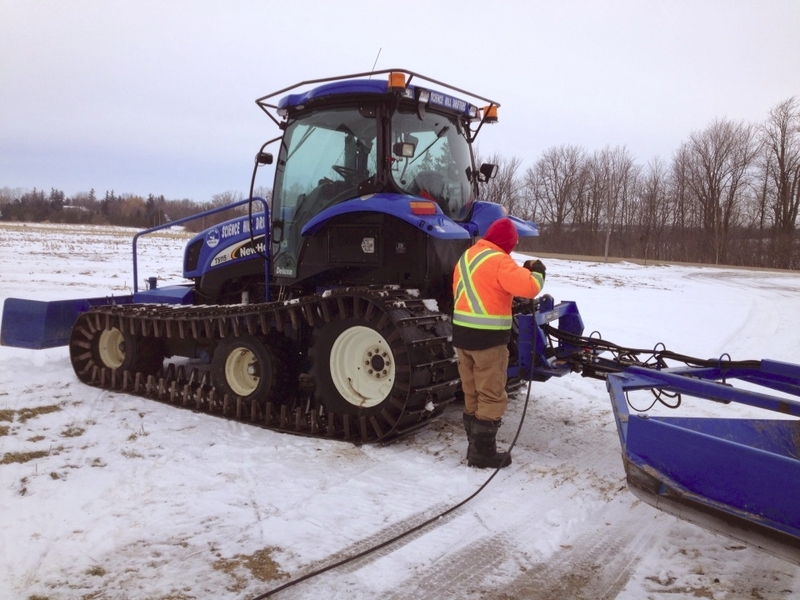 We use 2 converted farm tractors built by Ebert Welding in New Liskard Ontario, and they are specifically designed for grooming snowmobile trails. The oldest tractor is a 2001 Ford New Holland TM 125 with 110 horse power, and our 2005/2006 addition to the fleet is a Ford New Holland TS115A. 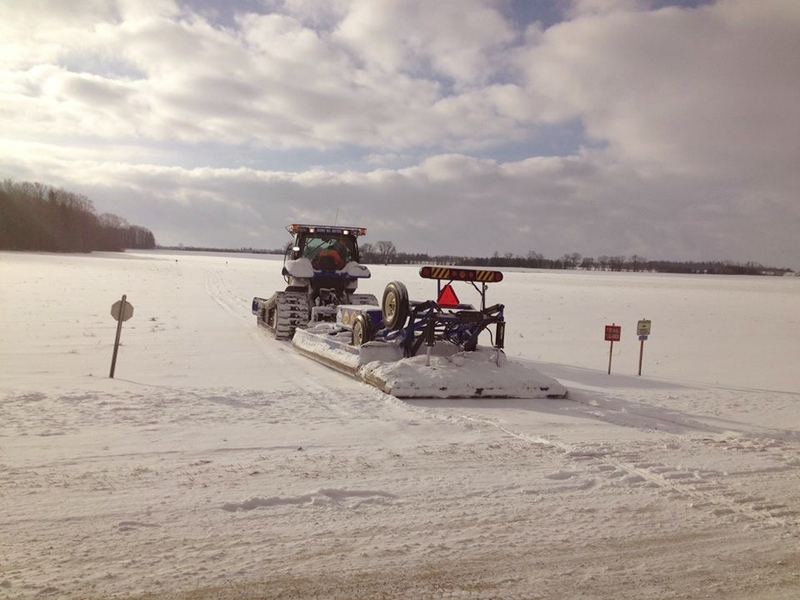 We have 2 drags that we use for trail leveling, and the complete groomer/drag unit with no snow load weights 9 metric tonne and is 9 feet 6 inches wide. All of our trails (except bushes ) are groomed "double-wide". One complete tractor/drag unit when new is worth approximately $140,000.00, so we take great care of our equipment. Your support in our Club has allowed us to prosper and have some of the best equipment available today to keep our trails up to the smooth conditions you have come to expect from us. One groomer is stationed at our Club house, and the second groomer is in the Lucan/ Ilderton area. Both groomers are maintained and operated by a group of dedicated volunteers from both areas. We try to groom our trails twice every week when conditions are right, and having a 2nd unit helps to provide a backup in case of break downs. It may look like grooming is an easy job ... but it is not! Snow is a very tricky material to work with and does not always do what you would like. The groomer operator is constantly making adjustments to the drag to compensate for the varying conditions of the snow. 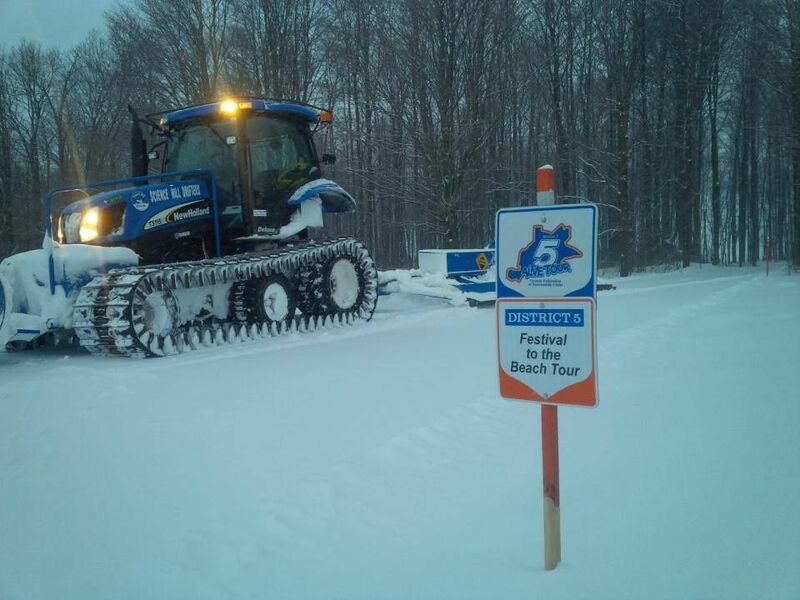 The moisture content and temperature have a lot to do with how a trail turns out after it is groomed. Almost every Club tries to groom primarily at night, as the colder temperatures and lack of sunlight help to set the base. Also, the lack of sled traffic helps to give the base longer to set up and harden (something like concrete) but depending on the snow conditions a hard base is not always obtainable. 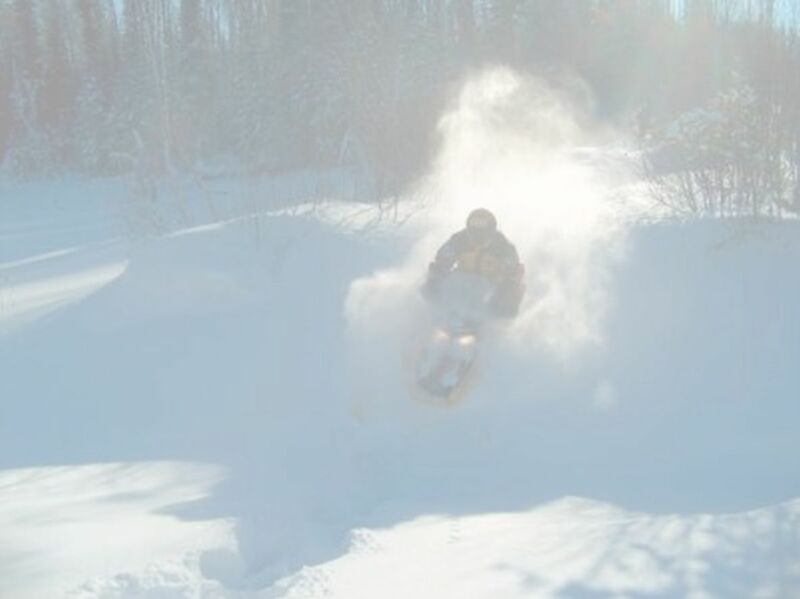 Check out "The Groomer Guy" blog to follow the adventures of a fellow groomer in Northern Ontario.